WALTER P. WOLVERTON was the son of Charles S. and Martha Anderson Wolverton. Charles S. Wolverton was a lifelong resident of North Camden and worked for the Pennsylvania Railroad for almost 50 years. After serving as a steamboat pilot and as a collector on the the Vine Street Ferry he became the Superintendent of the Cooper's Point Ferry, and remained so until it discontinued its service on October 31, 1926. He also served on the Camden Board of Education, and was the first chairman of the Camden Training and High School, later known as Burrough Junior High, up until the time of his death in August of 1935. Walter P. Wolverton was born in Camden NJ in 1882. His older brother was Charles Anderson Wolverton, who would go on to serve 16 terms in the United States House of Representatives from Camden. The Wolverton family had lived at 313 Birch Street in 1880, and moved by 1888 to 612 North 5th Street. 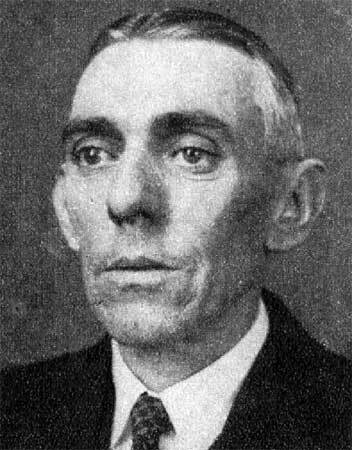 Walter Wolverton married around 1903. His wife Myrtle bore their first child, a daughter, Ruth, in 1904. His father Charles S. Wolverton, bought a home at 601 State Street shortly afterwards. While Charles A. Wolverton studied law, Walter Wolverton took up accounting. By 1920 he was working as the Paymaster for the City of Camden. At the time of the 1920 Census he owned a home at 718 North 7th Street, where he lived with his wife Myrtle and daughters Ruth, 15, Alberta, 13, and Myrtle, 7. The Wolverton family was still at that address in April of 1930. Youngest daughter Myrtle was still living at home, as was oldest daughter Ruth and her husband John Hyland. At the beginning of 1930 his official title was Chief Clerk of the Highway Department of the City of Camden..
Walter P. Wolverton was still employed at the Highway Department when his father passed away on August 8, 1935. Walter P. & Myrtle Wolverton subsequently moved to the house at 601 State Street, where they were living when the 1947 Camden City Directory was compiled. Walter Wolverton passed away at some point prior to 1959.